What is the minimum Internet speed required ? A Constant Internet Connection of 1.5 Mbps or above. But the recommended speed is 6 Mbps or more. What are the requirements for the Magic Vision TV receiver? High speed internet access with 1.5 Mbps or higher speed. A TV with HDMI or RCA input support. What is the Default Password for the settings in the Magic Vision TV? Is there a subscription fee for using Magic Vision TV receiver? No, there is no subscription to use Magic Vision TV receiver. After one year of purchasing the device there is a $59.99 / Year maintenance fee. What types of TV does Magic Vision TV receiver support? Any High Definition TV with HDMI and any Standard Definition TV that supports composite 1 video + 2 audio inputs. What video resolution does the Magic Vision TV receiver support? 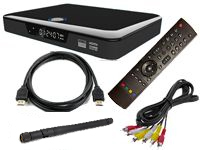 Magic Vision TV receiver supports 720p, 1080p. Does the Magic Vision TV have recording capability? Yes, Magic Vision TV have a PVR (Personal Video Recording) function, it allows you to program the device to record from any channel on a USB Memory stick or an external Hard Drive for the MVTVHD535N Model or in an internal hard drive for the MVTVHD435N Model. The Hard drives or the USB are not included with the device. Can I connect more than one TV to the Magic Vision TV receiver? No, only one TV can be connected to the Magic Vision TV receiver.